Sidney Sheldon joined the army during World War II but was disabled before seeing any action. He moved to New York City and began writing Broadway musicals. He continued to write for Paramount Pictures and MGM Studios. With the rise of television as a popular medium, Sheldon decided to try out his luck in it. He wrote a series called ‘The Patty Duke Show’ and for the next seven years wrote every episode of it. 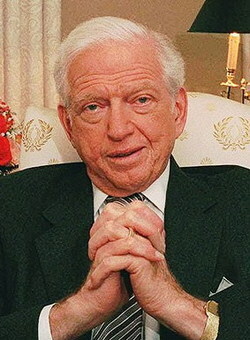 Sidney Sheldon wrote a whole raft of bestsellers even though he didn't start writing novels until after he turned 50. Sidney Sheldon's second novel The Other Side of Midnight (1973) became #1 on The New York Times bestsellers list. Wow, I had no idea he created the Patty Duke show. What a difference from his novels! I admit I only read a few of them, because the endings of those I did read were rather depressing...just not my type of read. He certainly had a following though! He's one of the authors I admire. And the way his novels end... it's like I like it. After all they are more life-like. I'd like to keep doing this post next year, too. I agree, never let the reader put the novel down! Yes. That's why Shadows of the Past ends each chapter in a cliffhanger. I was always astounded that he created the Patty Duke Show, among other tv shows. The show was actually pretty innovative. He taught us a lot about cliffhangers for sure. I am not familiar with this show but I know I enjoyed his books and the movies screened after them. Great author!